Think about the people you’re inviting and the type of event and we will help you decide on the style, design and fonts which will suit best. 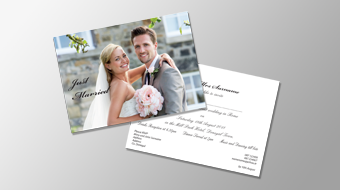 Coordinate your wedding package with save-the-dates, invitations and thank you cards. Show your appreciation with Thank You cards from Cavern Design Printing. Ideal for Wedding Gifts, New Baby, First Communions & Confirmations we also produce Thank You cards for Birthdays and other Special Events. Cards can be printed flat or folded style in various sizes and will come with envelopes to fit. 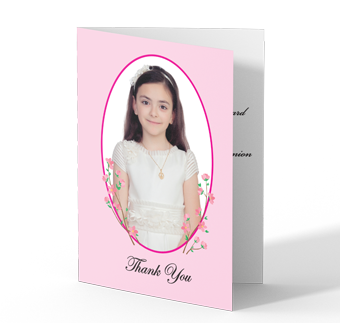 All cards are printed on high-quality porcelain card and will show your thanks in a memorable way. If you have a photo you would like printed – sometimes it’s nice to have more than your phone to look at – Cavern Design Printing can print from 6x4 size up to 13x19 in perfect photo quality.